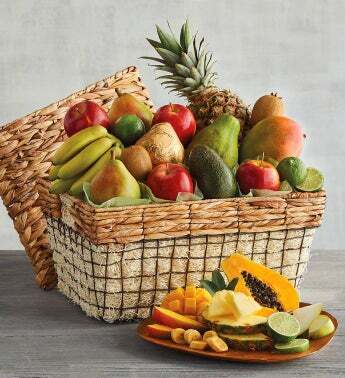 Every occasion is sweeter with the Deluxe Fresh Fruit Basket. This substantial basket is filled by hand with an assortment of fruit that starts with juicy pears and premium apples and goes on to include tropical delights such as a golden Brazilian papaya, a mango, and an avocado. Every fruit we include is of the highest quality. Colorful and delicious, this gift is sure to please.